The latest incarnation of the Mortal Kombat franchise to be released in October takes it's trademark "Fatality" system to a whole new level. This time around the finishing moves have become more integrated with the overall gameplay instead of being somewhat of a separate entity. Now not only can you perform brutal life ending moves on your opponent at the end of a match, but players also have to watch their step during each round (depending on what stage you fight on). The stage fatalities add an interesting dynamic to the fight. It's no longer a matter of playing the offense and trying to find the best way to pulverize your opponent. Instead, players also have to be defensive by making sure they are not lined up with various death traps. The stage fatalities are a throwback to MK games of earlier days and definitely cater to fans of the old finishing system with their cut-scene style. The match ending finishers are presented in an entirely new way and has been dubbed the "Create A Fatality" system. At the end of the round when you score that final winning blow you have a veritable cornucopia of ways to dispose of your opponent. This new system, somewhat reminiscent of Killer Instinct's combo finishers, allows you to chain finishing moves together allowing you to come up with your own way of destroying your opponent. Once the familiar voice tells you to "Finish Him/Her" a timer and fatality counter are displayed. Each time you successfully execute one of the predefined pad/button combinations your fatality counter increments by one and the timer resets, but the timer counts down faster as your fatality counter increases. This makes performing longer fatalities a lot more challenging. The fatality is broken down into several components: fillers, transitions, and enders. Fillers are moves that pad your fatality count and consist of things like punches, kicks, and other non-lethal blows. Transitions allow you draw a weapon or move your opponent to another position. This gives the player the ability to execute additional moves not available until after the transition move is performed. For example, to slice off an opponents left arm, you first have to perform the move to draw the sword. Or to break your opponents neck from behind you first have to turn them around. Enders are pretty self-explanatory: they end the fatality and consist of lethal blows like head rips, spine pulls, or neck snaps. The new "Create A Fatality" system has a very small learning curve -- I was able to understand and perform complex fatalities in a very short amount of time. One of my favorites finishers that I concocted was groin kick, heart rip, brain rip, draw sword, slice off right arm, arm rip, smack with arm, smack with arm, smack with arm, smack with arm, head rip or decapitate w/ arm. Overall, I feel that it is a fantastic addition to the game and I hope to see it expanded upon in the final release of the title. Cool.. I have a question.. can you do a move, then immediately start on another move or do you have to wait till the move is performed and the timer starts again? 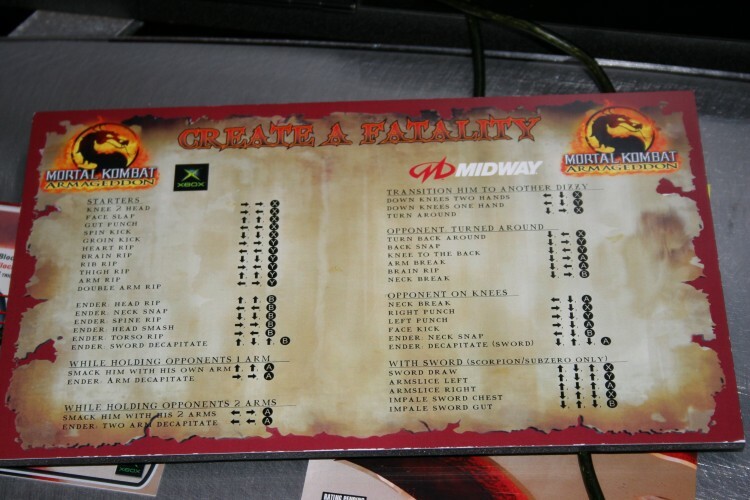 I also have a question... Are you only allowed to perform a fatality in the third round, or can you do it in the second? Your article says only in the third :-. Third round? I thought it was 2 rounds unless it is a tie it goes to the third. I'm confused now. Sorry, missed that in editing. It's the same as always. After you've defeated your opponent for a second time. No you can go as fast as you can input them. In fact when it gets to 7-8 hits, you have little time at all to even think about entering another move. This seems very complex. If we have to memorize a whole set of finishing moves for each character things could get ugly. I don't mind though, as long as they look good. Frankly the brain-rip looks absolutely horrible. You break into the guy's skull and yet it looks exactly the same afterward? I would just as much have that left out if I could. As long as each character has uniqueness I'm good. Unless they change the moves (which they probably will if they are smart).. they all look pretty similar so it shouldn't be too hard to come up with a pattern which gives you good results. If they do change the moves, that is going to be fun trying to find each one that is available. Well I do like the Create a Fatality part of the game. Its a fresh way to enjoy a new MK game. I still hope that the would thing of at least throwing in some finishing moves from back in the day. I have a feeling I will get bored real quick doing the create a Fatality. Maybe they can have some finishing moves you unlock for the different fighters. That would help spice it up a bit. I just want a good amount of options and replay value on an MK game. Look at MKSM. Man I went by that game quick and wanted more, but there wasn't. Of course that is a different style game all together as well. I did play MKD and loved it but that only lasted a month with me. I just want to see a good, 100%, non-rushed, completed with no bugs or glitches game. I agree with you Hydro. I also have a question. Lets say I've beaten my opponent and it says "FINISH HIM" and I quickly select "Fatality", do I have to do certain button inputs to do my created fatality or its just press any button to pull out the heart or arms. I don't think there's a delay, but my lack of skill w/ console pads caused me to have to repeatedly tap the motions until it recognized the move I wanted to perform and the timer reset. There is no selection of "Fatality." Once it says "Finish Him/Her" you can immediately perform the Create-A-Fatality combinations (you can refer to the list we posted from E3). Or we could input one code and watch the fun? Could you guys post a video of Shinnok pulling out the parts of the opponents body? BTW I dont have Quicktime 7 so is there a way I can watch it using MPEG format? I don't think anyone has the ability to do that anymore. These previews were done at E3 I think so I don't think requests can be filled at this time.